Contrary to expectations, the next generation of video game consoles does not look like its going to be a fight between Microsoft and Sony. Affirmed by Microsoft’s press conference in Redmond Washington yesterday, the future of the industry looks much more like two companies who were stopped by a fork in the road and are going in entirely different directions. Everything Microsoft presented for its next console was almost a polar opposite of Sony’s Playstation 4 event. These companies are in two very different positions and have very different objectives for their consoles and to that end, comparing them almost seems irrelevant. The common consensus is that Sony lost last generation. After dominating in the PS2 era, Sony’s PS3 produced an enormous price point, a lack of a truly impressive launch lineup, a botched online gaming environment, terrible friend list implementations and a poorly designed trophy system. With the announcement of the PS4, the company seemingly offered a mea culpa to core gamers. The PS4 essentially vowed to gamers that it would do right by them with this next generation. For Sony, the PS4 is an attempt to reestablish its foothold into the gaming market that it has lost. Microsoft however, has very different and distinct goals in mind. Like Sony after the PS2, Microsoft is boasting from a generational win, but rather than sustain the marketplace, the company’s aims are much larger. Everything that was showcased yesterday reinforced that with XBOX One Microsoft is going after casual gamers and non-gamers. Let’s be clear about this, Microsoft isn’t competing with Sony’s PlayStation 4; they are going after Cable boxes, Time Warner, Apple TV, Roku, Skype, Blu Ray players, Laptops and iPads. From the start, it was clear that this was not a gaming first console as Kotaku’s own Evan Narcisse said as much on the live blog. 1:08 Evan Narcisse: Xbox One looks a lot like a cable box! The Nintendo Wii may be dead, but its influence and impact on the industry may have more to do with the direction of this next XBOX than you realize. For Nintendo, the Wii made ridiculous amounts of money for Nintendo, far more than expected. Nintendo didn’t anticipate the high adoption rate of the system outside of the core gamers and proved that gaming consoles could penetrate the larger consumer market. This, in turn, revealed limitless sums of potential money console makers could tap into. This is not just speculation either; tangible evidence from their press conference yesterday can clearly show that the focus is no longer primarily on games. Deals with the NFL, Cable providers, and cross device functionality implementation are no small feats and were all major touch points of the XBOX One presentation. Think about how many hours of work and people were required to get these deals off the ground. Countless manpower hours went into these features and none of them have anything to do with gaming. Microsoft did announce that within a year they will release 15 games through Microsoft Studios, and that 8 of those titles will be new IP. However, one slide in an hour long presentation and one trailer, doesn’t really confirm anything. And these titles are just in development, who knows if they will be released or to what capacity these games will actually be. Its also telling that most of the games they showed off yesterday were all the high end touch points; Call of Duty, Fortza and Madden or Cars, Sports and Guns. Call of duty will exist on the new device because it has to. Activision stands to lose too much money. Of course, XBOX One can expect Assassin’s Creed, Halo and every other multimillion game seller, but about those great indie titles like Jonathan Blow’s Braid? Microsoft addressed nothing about its current policy restrictions and how that relates to so many games like Fez. They didn’t address it, because they don’t really care as it doesn’t fit into the business plan of what they are trying to pull off for XBOX One. Much of the reaction in the gaming community has been negative. The gaming community is upset about the lack of backwards compatibility, blocking used game sales, mandatory Kinect usage and internet connectivity requirements. Gamers are acting like an ousted boyfriend, begging and pleading for change so they can save their relationship. This behavior to me is missing the point entirely. What these gamers fail to realize is that the relationship is already over, Microsoft has already moved on. They are now in love with the casual market and non-gamers; putting all of their time, money and effort into making them want to buy XBOX One. The fork in the road I alluded to at the beginning of this article was the troubled economics of the video game market. This is a huge issue in the video game industry as games are more expensive than ever to make, and the possibility of turning a profit is more difficult than at any other time. The signs continue to show themselves as Activison CEO Bobby Kotik recently publicly stated to investors that he is worried about the vitality of the next generation. The Activision CEO, the guy who is guaranteed to make billions between Call of Duty, StarCraft, and Diablo is worried about being about to make money by just making games. I am willing to bet that the CEO’s at Microsoft will not judge this console based on how much market share of the gaming audience it maintains or grows, but rather how much market share of the casual market it can get into. I would go as far to say that Microsoft may not even really try all that hard to win gamers over and let Sony take what it can. Microsoft can now make money with XBOX One without video games. That is the single most important thing about yesterday’s press conference. Microsoft is a business and there are many more non-gamers in the United States than there are gamers. 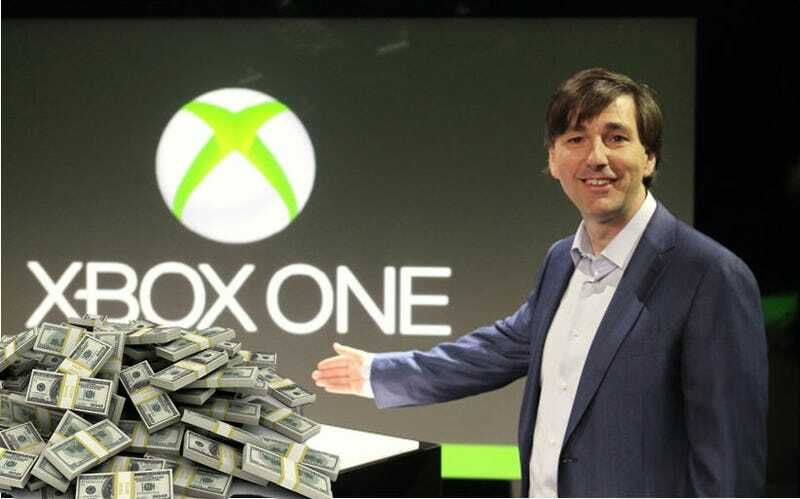 If XBOX One can get into the homes of people who have no interest in video games, then they stand to make buckets of money (just like the Wii did). However, once Microsoft gets in the ones, unlike the Wii, they plan to stay put by the way the system addresses so many needs in one box. For Microsoft, that is what this generation is about. Their target is Joe Everyman and they are wooing him with news that he can play fantasy football better, watch Netflix easier, watch television, video conference his friends, and yeah, play Call of Duty every now and again. The XBOX One doesn’t need gamers, it doesn’t need Kotaku’s PR, it doesn’t need a great launch line up, it doesn’t need first party exclusives, it doesn’t really need E3; it needs a Today Show appearance, catalog listings in Best Buy’s Sunday paper, and some word of mouth from Joe Everyman. They need the favorable press that they have been getting from every non gaming site like CNN, Fox News and MSNBC. XBOX One is not a console for gamers, because it doesn’t care about appealing to them. All of the company’s manpower will go into helping the system appeal to modern America and if some of them are gamers, well than that is just a coincidence.